Eye Patches - Boy, Non-Woven 2.313" x 3.344"
THIS ITEM IS CURRENTLY ON BACKORDER. 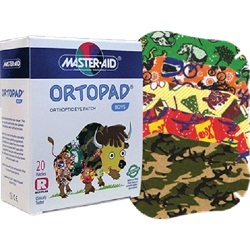 The Girl Master-Aid Ortopad patch is made of monostretch non-woven material with a hypo-allergenic latex free adhesive, therefore virtually eliminating skin irritation and allergies. The patch contains a special light protection inlay assuring maximum shielding from light. Assortment of boy themed patches that measure 2.313" x 3.344". Comes 20 per box.